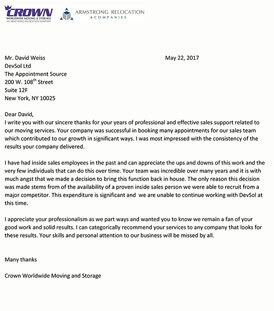 "I write you with our sincere thanks for your years of professional and effective sales support related to our moving services. Your company was successful in booking many appointments for our sales team which contributed to our growth in significant ways. I was most impressed with the consistency of the results your company delivered. I have had inside sales employees in the past and can appreciate the ups and downs of this work and the very few individuals that can do this over time. Your team was incredible over many years. " 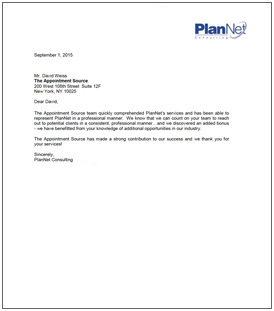 "The Appointment Source team quickly comprehended PlanNet's services and has been able to represent PlanNet in a professional manner. We know that we can count on your team to reach out to potential clients in a consistent, professional manner...and we discovered an added bonus - we have benefitted from your knowledge of additional opportunities in our industry. The Appointment Source has made a strong contribution to our success and we thank you for your services!" 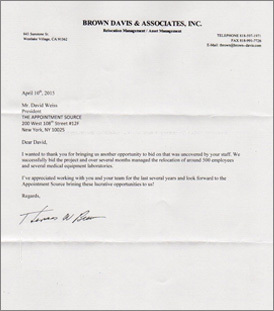 "I wanted to thank you for bringing us another opportunity to bid on that was uncovered by your staff. We successfully bid the project and over several months managed the relocation of around 500 employees and serveral medical equipment laboratories." "We have tried other lead development programs in the past and your results blow away anything else I have seen." "I want to take this opportunity to thank you and your staff for the fine job you've done over the last 12 months providing our company with commercial moving leads. I always know when I go out to visit a prospective client that has been generated by your company that it will be qualified lead and it's my job to close it. In the last six months I've had close to an 80% closing ratio on the moves you've provided our firm. Thank you once again and keep them coming!" 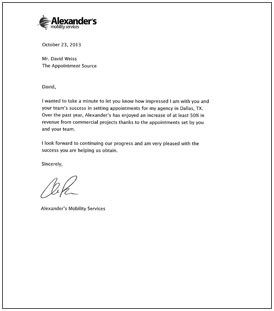 "I wanted to take a minute to let you know how impressed I am with you and your team's success in setting appointments for my agency in Dallas, TX. 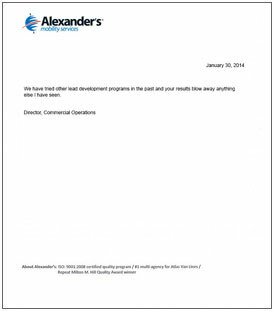 Over the past year, Alexander's has enjoyed an increase of at least 50% in revenue from commercial projects thanks to the appointments set by you and your team. I look forward to continuing our progress and am very pleased with the success you are helping us obtain." "We have been using The Appointment Source for over 2 years to help us generate opportunities for our sales team. From the beginning, The Appointment Source has delivered as promised. The information we receive is consistently detailed and accurate. We find that the prospects with whom we meet have been well briefed on our services prior to our scheduled meetings. 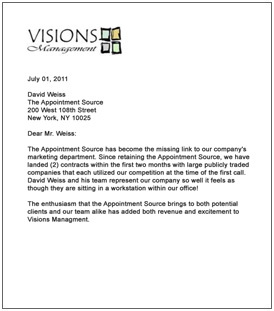 The Appointment Source has proven to be a very valuable resource to our business. I am happy to take phone calls to discuss their performance in more detail." 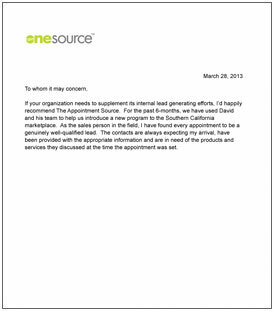 "If your organization needs to supplement its internal lead generating efforts, I'd happily recommend The Appointment Source. For the past 6 months, we have used David and his team to help us introduce a new program to the Southern California marketplace. As the sales person in the field, I have found every appointment to be a genuinely well-qualified lead. The contacts are always expecting my arrival, have been provided with the appropriate information and are in need of the products and services they discussed at the time the appointment was set." 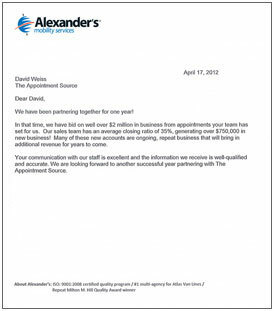 "We have been partnering together for one year! In that time, we have bid on well over $2 milion in business from appointments that your team has set for us. Our sales team has an average closing ratio of 35%, generating over $750,000 in new business! Many of these new accounts are ongoing, repeat business that will bring in additional revenue for years to come. Your communication with our staff is excellent and the information we receive is well-qualified and accurate. We are looking forward to another successful year partnering with The Appointment Source." "The Appointment Source has become the missing link to our company's marketing department. Since retaining the Appointment Source, we have landed (2) contracts within the first two months with large publicly traded companies that each utilized our competition at the time of the first call. David Weiss and his team represent our company so well it feels as though they are sitting in a workstation within our office! The enthusiasm that the Appointment Source brings to both potential clients and our team alike has added both revenue and excitement to Visions Managment." "I just wanted to reach out and say how helpful you and your team have been to me in every sense. I truly appreciate your success in getting me in front of key decision makers. Thank you once again for all your support." 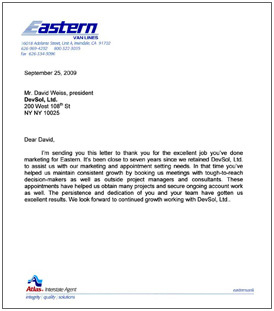 "I'm sending you this letter to thank you for the excellent job you've done marketing for Eastern. It's been close to seven years since we retained The Appointment Source to assist us with our marketing and appointment setting needs. In that time you've heped us maintain consistent growth by booking us meetings with tough-to-reach decision-makers as well as outside project managers and consultants. These appointments have helped us obtain many projects and secure ongoing account work as well. The persistence and dedication of you and your team have gotten us excellent results. 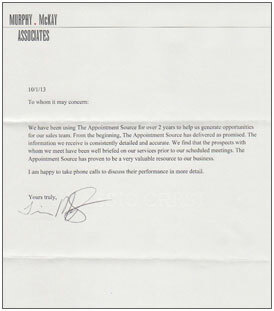 We look forward to continued growth working with The Appointment Source." 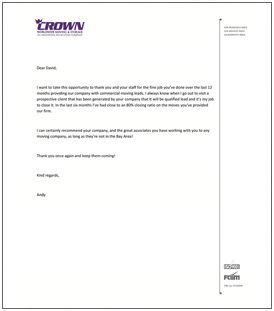 "I wanted to drop you a note and let you know how pleased we have been with the service your firm has provided to Learn iT over the past 6 months. 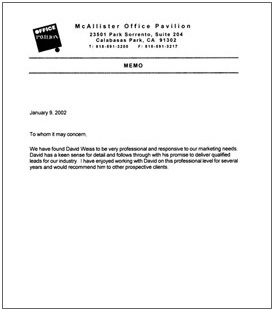 Our sales reps needed qualified appointments with decision makers and The Appointment Source delivered as promised. The appointments booked for us were well-qualified and the information provided on each prospect was detailed and precise. Several of the appointments have already become closed sales and we expect that, in time, more of them will as well. 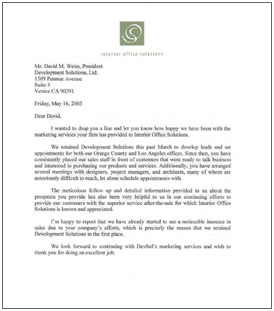 We appreciate your efforts and look forward to building our relationship with The Appointment Source." "I wanted to thank you for persistance and hard work with InnerVision over the past 5 years. Your firm has consistently helped InnerVision to present and close new prospective companies that required our services. The decision makers of these companies are typically very difficult to reach and many times we at InnerVision have been unable to reach them ourselves." 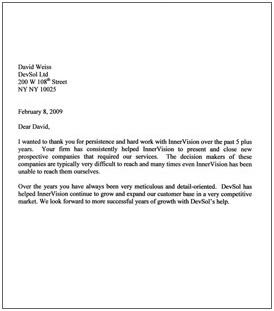 "I'm writing this letter to let you know how happy we are with the marketing services your firm has been providing to InnerVision. Within the first month of using your services, we closed two brand new accounts. We weren't expecting to see results so quickly. This was a pleasant surprise. Communication with you and your team is excellent and the information that we receive from you is always detailed and accurate. It is a relief to know that we can rely on you to make sure that leads are always followed up on and that we are being kept abreast of fresh opportunities regularly. For us getting leads has never been a problem, but having the time to call each one and follow up is where we needed help. As you know, it is difficult to service existing clients and prospect for new business at the same time. Your service has made it possible for us to grow our business and provide excellent service to our customs and build a great referral base." "I wanted to drop you a line and let you know how happy we have been with the marketing services your firm has provided to Interior Office Solutions. We retained The Appointment Source this past March to develop leads and set appointments for both our Orange County and Los Angeles offices. Since then, you have consistently placed out sales staff in front of customers that were ready to talk business and interested in purchasing our products and services. Additionally, you have arranged several meetings with designers, project managers, and architects, many of whom are notoriously difficult to reach, let alone schedule appointments with. The meticulous follow up and detailed information provided to us about the prospects you provide has also been very helpful to us in the continuing efforts to provide our customers with the superior service after-the-sale for which Interior Office Solutions is known and appreciated. I'm happy to report that we have alrady started to see a noticable increase in sales due to your company's efforts, which is precisely the reason that we retained The Appointment Source in the first place. We look forward to continuing with your marketing services and wish to thank you for doing an excellent job." "Thank you very much for the Sales Seminar that your organization presented to our Sales Team recently. Your techniques for cold calling and prospecting have already helped me get beyond the gatekeepers on my first call. Your years of experience and the examples you shared from some of your actual calls have also helped close some tough prospects. 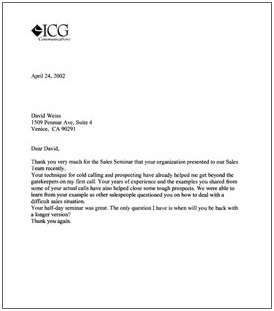 We were able to learn from your example as other salespeople questioned you on how to deal with a difficult sales situation. Your half-day seminar was great. The only question I have is when will you be back with a longer version?" I wanted to drop you a line and thank you personally for helping PDC increase sales and visibility in our industry. We've never had the time to follow up on the leads that we receive and when we did, we couldn't get through to the right contact. I'm amazed at the ease you seem to have getting to the right person and then setting appointments for a site walk. 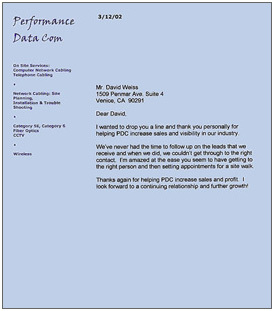 Thanks again for helping PDC increase sales and profit. I look forward to a continuing relationship and further growth!" "Thank you for your seminar on prospecting techniques and setting appointments. Our sales staff and myself were very appreciative of the material and concepts we learned. As you were aware our sales staff is a senior sales group and a "tough sell" with the basics of selling-prospecting and setting appointments. Following the seminar, I was pleased to hear them discuss with each other the fresh ideas you shared and some new innovative suggestions on how to reach the decision makers. 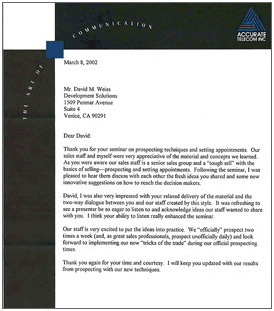 David, I was also very impressed with your relaxed delivery of the material and the two-way dialogue between you and our staff created by this style. It was refreshing to see a presenter be so eager to listen to and acknowledge ideas our staff wanted to share with you. I think your ability to listen really enhanced the seminar. Our staff is very excited to put the ideas into practice. We "officially" prospect two times a week (and, as great sales professionals, prospect unofficially daily) and look forward to implementing our new "tricks of the trade" during our official prospecting times. Thank you again for your time and courtesy. I will keep you updated with our results from prospecting with our new techniques." 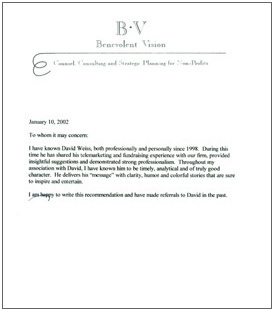 "I have known David Weiss, both professionally and personally since 1998. During this time he has shared his telemarketing and fundraising experience with our firm, provided insightful suggestions and demonstrated strong professionalism. Throughout my association with David, I have known him to be timely, analytical and of truly good character. He delivers his message with clarity, humor and colorful stories that are sure to inspire and entertain. 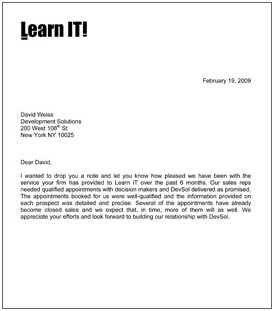 I am happy to write this recommendation and have made referrals to David in the past." "We have found your services to be very professional and responsive to our marketing needs. You bring a keen sense for detail and follow through with your promise to deliver qualified leads for our industry. I have enjoyed working with The Appointment Source on this professional level for several years and would recommend him to other prospective clients." "As 2001 draws to a close, I just wanted to drop a note in the mail, expressing my thanks to you for your efforts and for a job well done over the last two years. 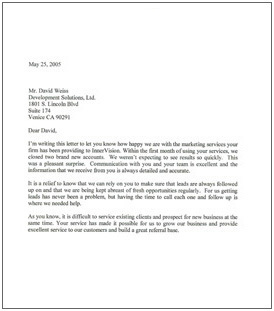 We have been doing business together for seven years now, and I've always appreciated your honesty, as well as the effort that you've put into the marketing side of our business. Much of your success is a result of the diligence you expend toward networking, research, and just in ‘being in the know' in terms of who's moving and where new business opportunities might lie. Much of our success and growth has come through your efforts; keeping our sales force out in the streets, visiting with customers, walking jobs, and booking business. Over the years, I've frequently asked you just where you find out about the moves coming up, and you've always professionally replied that that is simply your job to do so! The opportunities that you've brought me culminated in the forming of my company two years ago, when I elected to leave my last employer and go out on my own. I was fortunate when you decided to join my new company. Since then, you've kept my salesmen and me extremely busy; often walking three to four jobs a day! 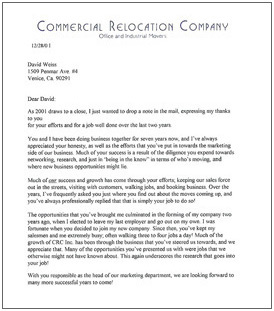 Much of the growth of CRC Inc. has been through the business that you've steered us towards, and we appreciate that. Many of the opportunities you've presented us with were jobs that we otherwise might not have known about. This again underscores the research that goes into your job! With you responsible as the head of our marketing department, we are looking forward to many more successful years to come!" 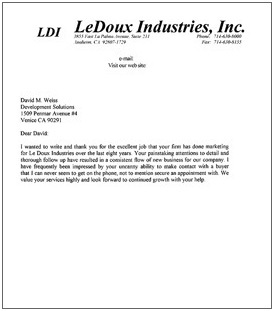 "I wanted to write and thank you for the excellent job that your firm has done marketing for Le Doux Industries over the last eight years. Your painstaking attentions to detail and thorough follow up have resulted in a consistent flow of new business for our company. I have frequently been impressed by your uncanny ability to make contact with a buyer that I can never seem to get on the phone, not to mention secure an appointment with. We value your services highly and look forward to continued growth with your help."